Berkeley, CA â€“ 28 September 2011 â€“ It’s old school American horror versus comic book horror hunter in this year’s HACK/SLASH ANNUAL 2011! 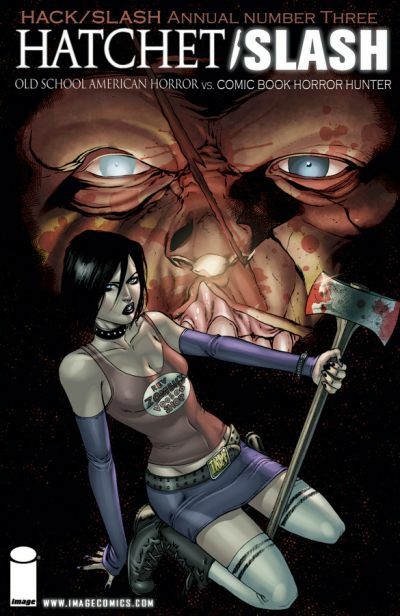 Two of horror comics’ biggest stars, Cassie Hack and Vlad, will soon come face to face with Victor Crowley of writer/director Adam Green’s cult favorite HATCHET series of films. GUARDING THE GLOBE writer Benito Cereno has teamed up with star-in-the-making Ariel Zucker-Brull for the 48 page HACK/SLASH ANNUAL 2011—a momentous mash-up! In the Louisiana Bayou, the murderous ghost of Victor Crowley is maiming tourists in creatively horrible ways. But in his blind murderous rampage, he may have created something worse than himself! Now, Cassie and Vlad are back in New Orleans, and it won’t be long before baseball bat meets hatchet and deformed mutant meets deformed mutant! HACK/SLASH ANNUAL 2011: HACHET SLASH (Tim Seeley & Mark Englert cover: SEP110377, Aiel Zucker-Brull cover: SEP110378), a 48-page full color horror comic for $4.99, will be on sale in stores November 2. For more information about Tim Seeley and HACK/SLASH, visit http://timseeleyart.blogspot.com/.